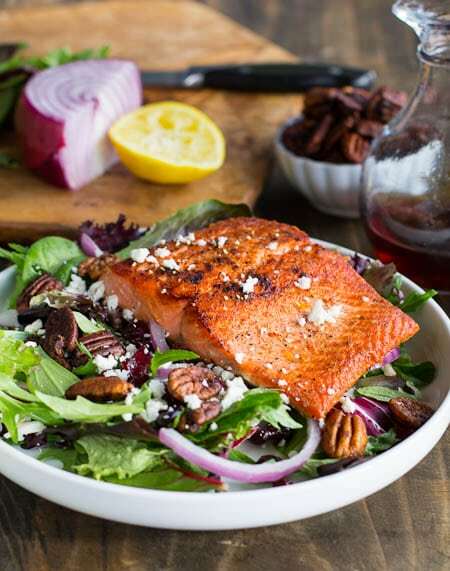 A mixed green salad with dried cranberries, feta cheese, red onion, and candied pecans tossed with Raspberry Vinaigrette and topped with seared salmon. Salads truly are one of my favorite things to eat especially a really substantial salad that can stand alone as a meal. 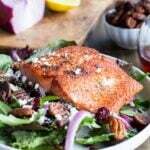 Salmon is one of my favorite proteins to add to a salad when I’m sick and tired of chicken. I love how it is so easy to flake apart with your fork into little bite-sized pieces so you get some in every bite. Plus salmon is such an oily fish, I always find myself adding less salad dressing to my salad when it contains salmon. 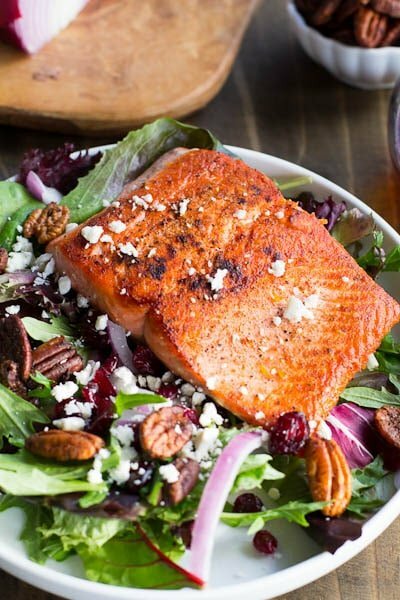 This Seared Salmon over Mixed Greens Salad makes a filling lunch or dinner and is a great way to use up leftover salmon. Who can resist a mixture of nuts, cheese, and dried fruit? 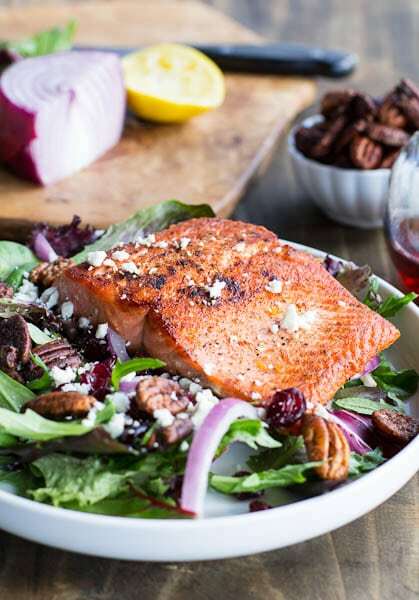 Seared Salmon served over mixed greens with dried cranberries, feta cheese, and candied pecans and a raspberry vinaigrette. Combine corn syrup, sugar, salt, and cayenne pepper in a medium bowl. Add pecans and stir to coat. Spread on baking sheet and place in oven 5 minutes. Stir and place back in oven for 10 minutes. Let cool. Make Vinaigrette. Whisk together vinegar, lemon juice, and honey. Gradually add in canola oil, whisking continuously. Season with salt and pepper. Set aside. Make Salmon. Season salmon with salt and pepper and sprinkle with paprika. Heat oil in a large skillet over medium heat. Place salmon in pan, skin side up for about 4 minutes. Turn and cook until salmon is medium-rare, about 4 more minutes. In a salad bowl, toss mixed greens with cranberries, red onion, and feta. Divide between 4 plates. 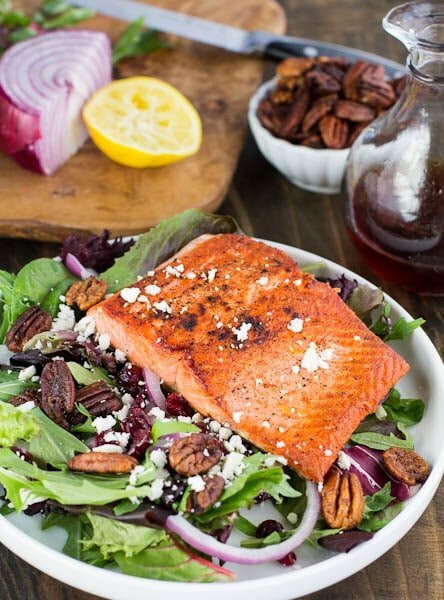 Top with salmon and pecans and drizzle with Vinaigrette. This entry was posted in Salads and tagged feta cheese, salad, salmon. Bookmark the permalink. Oh Christin, I love salmon too and a good salad with everything like you have made. Looks really delicious!! Nice pictures too! 🙂 Would make a great supper! Wow – that salmon has been seared so well! Paired with the candied pecan and raspberry vinaigrette, it sure sounds delectable! I eat salmon weekly, and love it in salads! Salads are best when they include dried fruit, cheese, and nuts in my book, so this meal is something I would truly enjoy! Love salad and you have all of my favorite things in this one: salmon, pecans, feta, and raspberry vinaigrette! Maybe I’ll whip this up tonight with the rogue salmon in the my fridge! Sounds like a lovely light meal, perfect for the more Spring like weather we’re getting here! This looks delicious! Simple and healthy. That salmon is so VIBRANT, and looks just so so delicious! Love everything about this salad!